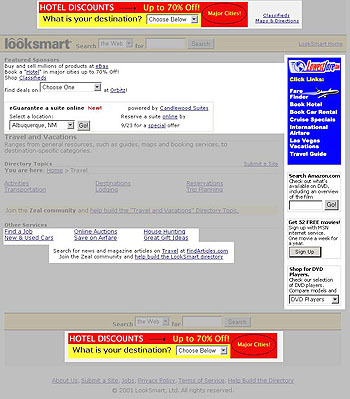 This is an example of a typical Looksmart page, back in the days when they ran ads - lots and lots of ads. The white areas here highlight the twenty-one paid ads on this page, and it was my job to touch all of them. As the ad operations web developer I was responsible for adding code to allow them to be tracked by our ad server, ensuring that they met our (fairly stringent) file size restrictions, and sometimes designing them. I also assisted with the development of new ad products, creating mockups for proposed new products and implementing trials and rollouts. In the three years I was at Looksmart, I took on more responsibilities, which included design and development of the Looksmart Centers. Besides doing the design and implementation of these subsites, I was a technical liason between our engineering department and the sales reps and clients. I also managed a wee team of one other web developer (with two of us, that counts as a team). On the technical end of things I became well-versed in Unix (bash shell) and Vi. I performed all the Quality Assurance testing on the Centers, and on key ad server configuration files, as well as doing the actual installation of these files to our production servers.